require premium gasoline. You know about E85 and flex fuel vehicles (FFVs) that can run on any blend between E0 and E85, but did you know there are more of them than diesel and premium cars and light trucks combined? FFVs now total about 27 million in operation. On top of that, since the 2012 model year, 25 million cars and light trucks have been built and warrantied by their manufacturers to run on E15. Add FFVs to those E15 vehicles, and you’ve got more than 50 million cars and trucks built to use E15. Along with the cars and trucks EPA has approved to run on E15 (every car or light truck built since 2001), you’ve got a whopping two hundred million cars approved to run on E15. That is 80 percent of the cars and light trucks on the road today. Even if you’re concerned about warranties – already more cars and light trucks built and warrantied for E15 and flex fuel use than all the diesel and premium cars and light trucks combined! 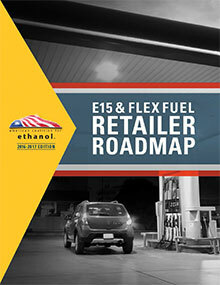 Few of your competitors are offering E15/flex fuels (see the actual counts in the state section of the roadmap). Why fight half the people in the bakery for a tiny slice of the pie, when you can have an entire pie to yourself?